IHG to buy Belmond to add a true luxury brand? IHG to buy Belmond (the old Orient Express Hotels) to add a true luxury brand? IHG, which operates InterContinental, Holiday Inn, Holiday Inn Express, Crowne Plaza, Hotel Indigo etc, has been talking recently about its desire to buy a ‘true’ luxury hotel brand. Whilst InterContinental does have some excellent five star hotels, they are primarily business focused city centre properties. The few InterContinental resort hotels, mainly in Asia, are generally well regarded but sit a little oddly in the context of the broader brand. I have seen a few names banded around recently, including – laughably – Mandarin Oriental and Peninsula. I struggle to think of anything that would be worse for the luxury hotel sector than to see IHG get its hands on either of those. The Ritz Carlton was sucked into Marriott many years ago and with very negative consequences, although there have been signs in the last couple of years that the brand is regaining some of its former lustre. On Thursday The Times ran a story which DOES make sense. IHG is rumoured to be in talks to buy Belmond. Whilst the Belmond name may not be familiar to you, you have probably heard of its old name, Orient Express Hotels. The company rebranded a couple of years ago after a dispute with the ultimate owners of the Orient Express name. I think that Belmond and IHG would make a good couple. Belmond tells people that it is a luxury hotel brand. It certainly runs some iconic properties which are world famous. However, to those of us in the industry, it is a bit of a joke. It would never be discussed in the same breath as Four Seasons, Mandarin Oriental or Aman. This means that IHG couldn’t mess it up. There is only upside – the hotels would benefit from being part of a wider group, there could be some shuffling of the leisure-focused InterContinental hotels into Belmond and we would benefit from being able to redeem IHG Rewards Club points at some high end leisure hotels. ….. amongst others. They are also taking over a hotel in Chelsea later this year. IT'S BACK: Get a 35% bonus on hotel transfers to Avios - but is it a good deal? It does sound like a good fit. Das Cataratas Iguassu is one of my all time favourite hotels! For anyone that has ever stayed at and dined at Le Manoir au Quat Saisons, they will know exactly where I’m coming from here…. Having stayed at, and dined at Monsieur Blanc’s iconic property a number of times myself, I would personally rank it as one of THE very finest in the world. This outstanding property and restaurant leaves any where else I have ever stayed in the world, including Intercontinentals, Conrad’s and Mandarins, standing by a mile. For LMAQS to become part of the faceless IHG would surely, long term, be an erosionary disaster of what it stands for. The only properties that come close for my money (in the UK), would be The Lanesborough or Claridges in London which, as LMAQS does, exemplify the true meaning of customer & guest service and exquisite Michelin star cuisine. Please, NO IHG for LMAQS!! I wonder how many IHG points would be needed for a trip on the Belmond British Pullman, Royal Scotsman or the Grand Hiberian? Exciting, there are some great destinations on there!. Has anyone experienced IHG app running in background and draining phone battery. 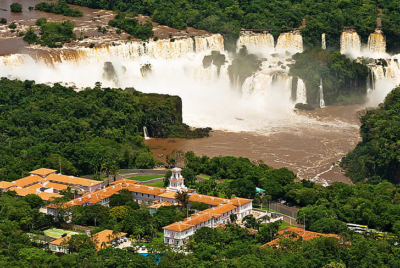 Iguacu falls is probably my favourite place in the world – and I’ve travelled a fair bit – although I stayed in a £2.50 a night hostel (including breakfast!). A bit OT, sorry. Definitely agree – I loved Iguassu. Couldn’t afford a luxury hotel at the time though ! Most Belmond properties are extremely impressive. They own and run their properties – many of which are iconic and historic – and have deservedly built a reputation for extraordinary staff and service in the hotels is exceptional. Each hotel is run with respect to its unique cultural style and identity. Many of their properties are destination – attractions in their own right. Personally I would trade a stay in a suite at the Four Seasons Denver for any entry level room at the Splendido in Portofino. They are definitely not a joke. They really aren’t (in my view). Take a look at, say, Gallivanters Guide or the Flyertalk luxury hotels forum where discussion on Belmond is nil. The Chelsea hotel is next to my kids school and is unlikely to be anything special given the size. Yes, “your industry” isn’t really luxury travel is it? The absence of chatter on Belmond on the points circuit is possibly due to the fact they don’t participate in points schemes. In terms of providing luxury accommodation, they are very much not a joke, and as others have noted, the equal of Four Seasons and Madarin. Neither the luxury hotels bit of Flyertalk or Gallivanters Guide have anything to do with points and both treat Belmond as second tier, as I do. In 15 years of reading Gallivanters Guide I cannot think of a single annual award they won, which would be nil out of about 200 over that period. Bit bloody late. Going to Cape Town next week and, as I need a few last IHG points, have booked into the completely average Holiday Inn. They have nothing better within 200 miles. Believe me, I’ve checked. Can they do this tomorrow? IHG presence in SA is rather limited. Re Cape Town restaurants, we found Chefs Warehouse very good and the Fork excellent. Good number of Marriotts though since they bought Protea. Bag your IHG points (maybe add a bonus package?) then jump ship? Marriott is running a 2-3k promo per stay, but the best is that all CPT Marriotts seem to be Cat1-5 so those free night vouchers would work on them, it’s hard to find a useful UK Marriott that isn’t above Cat5. As someone who started staying at La Residencia in Deia in the 1990s I was dismayed when Orient Express took it over and proceeded to plunder the good name and facilities with far too many new rooms which put excessive strain on the once overly luxurious free space and pool. It was already a cash cow but they have proceeded to milk it to the n’th degree. I no longer stay there as though these days I can far more easily afford the €30 plus it costs for a simple drink I would rather give my business to a hotel which deserves it. However, non can match the beauty of La Residencia of yesteryear and IHG buying Belmond won’t change that. I’m with you Rob – Belmond would be a great fit; they aren’t the best set of hotels in the world and very over priced for what they offer to be honest in my personal opinion. We were shocked when we visited Reid’s Palace in Madeira; every blogger raves about it and we got there and was like…REALLLLLY! OT (perhaps @andrewseftel specifically) How do I go about redeeming Shangri-La GC points in the restaurant without redeeming a set amount for a voucher? I can’t find anything about it online. Its as simple as that.. I redeemed in Oman in January and Bangkok last weekend. Just say you would like to use your GC points and its done. You can also part pay but choice or due to your balance. I think this is much better value as a redemption that 9,500 points for a £250 room (as mentioned as a comparator in the 35% bonus article).